Breaking Ground for Connected Living ~ Seed a New Way! Shepherds Ground is a cutting-edge project. We are in the midst of securing a dream. A dream to build a rural village of twenty nine homes nestled on a scenic 10 acre area of a 277 acre farm. 200+ acres will be used by local and community farmers for sustainable food production. Shepherds Ground is a not-for-profit structured organisation, supporting the community. To bring about this vision for economic, social and environmental renewal it is critical that we raise the funds needed to buy the land and kick-start the project. Be part of this vision for the future, to share across Australia and beyond. In October 2014 the Development Application (DA) was unanimously approved by the Port Stephens City Council and described as a blueprint for all future rural land share organisations across Australia. Bank control of people's lives and the future? Food monopolies, factory farming and genetic modification? Economics that encourage environmentally exploitative practices? Mental health issues in our society arising from a lack of community connection? The isolation of our elders and their value as contributing members of society? Caring for the earth and farming organically? Low cost environmentally friendly housing? A safe environment in which our children live and play? A community caring for our elders, children and each other? We are challenging the paradigm that only people with deep pockets or those deeply indebted to the bank, have the right to own their own home or productively farm the land for their local community. We are also addressing the paradigm that farming must be exploitative of animals and the environment to be economically viable. Combine the financial security of the older generation with the desire to work on positive change for the younger generation. We have already raised just over 80% of the land value. $245, 000 will go directly to purchase and secure the land for this generation and generations to come as a sustainable workable and regenerated environment. Reconnecting people, agriculture and nature. As a growing and thriving community Shepherds Ground will then be able to provide fresh produce, ongoing courses, programs, events and retreats in organic, biodynamic, permaculture, and sustainable living. As an investor you can access any of these benefits, as well as be connected to people who are passionate about the same things as you!! Lucie Bruvel is a Social Entrepreneur and initiator of the Shepherds Ground village and farming land share. She grew up in Duns Creek, NSW. Living in a village in France for 7 years inspired this vision. From her vision, a project was born! Several years on the project is becoming a reality. Shepherds Ground is managed by a Board of Directors and the land will be managed by the Shepherds Ground Farming Association. Lucie is also a Fellow of the School of Social Entrepreneurs (Sydney). 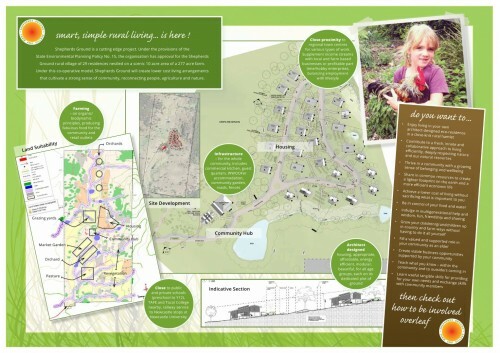 Shepherds Ground is described as a BLUEPRINT for all future land sharing organisations across Australia. Be a part of establishing this unique, cutting-edge sustainable living project. $50 Any Amount Helps Us! $100 Make a Bigger Splash! $500 Dine with us as we Party! $1,000 The More the Merrier for All! $5,000 WAHOO… So much to enjoy! $10,000 You won't know where else to go! You will receive: The same as the $5000 Perk AND: | An invitation to FOUR (instead of two) of Shepherds Ground Sensational Seasonal Banquets. (A delicious fresh, organic meal for you plus one) | SIX nights' camping (instead of four) on the 277 acre Shepherds Ground Property to experience its beauty! (meals included camping for four) | Access to your choice of FIVE field days (instead of four) | A TREE will be DEDICATED to you!!! $20,000 ALL of the above and moooorrree! $100,000 Be a major catalyst for something Incredible! ~ The perks for donations of this amount and above will be decided by The Board of Directors, you will receive a VERY special package PLUS ALL of the perks for the $20,000 donation. You will be dished up something that will show you how grateful we truly are! | You will ALSO get a BUILDING OR VENUE with your NAME on it! Get in touch with Breaking Ground for Connected Living ~ Seed a New Way!